Early Monday morning I headed over to Monticello to re-do the front window. I had great sales the first two weeks of the month and got lots of super positive feedback on my "Spring Cleaning" theme. 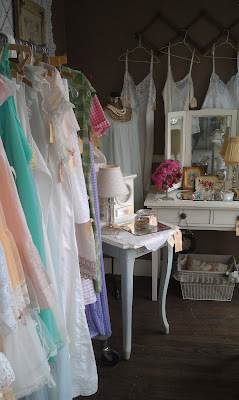 I basically emptied out the entire window and started from scratch to create a "Boudoir" theme with a huge rolling clothing rack full of vintage slips, nighties, dresses and more. Lots of jewelry including soldered necklaces, earrings and rings made from vintage finds, ticking pillows and vintages cases, a cute vintage vanity and a unique antique bench/chest which would be perfect at the end of a bed or in an entry. Darcey at Monticello took some great pictures of the space which you can see on facebook. If you're not already a facebook fan of Monticello, go right now and like them. It's a great way to get updates on what's going on with sales, specials etc. I'll be heading back in tomorrow with more goodies for the window and my regular space. Between restocking my booths and getting ready for Farm Chicks, I've beeen one busy girl. TTFN! I want that pink gingham dress in the window - will it fit me? :-) Maybe I'll see you there tomorrow. Oh La La - looks beautiful!! I love the window display! It is so cheerful and Springy :) Good job Lisa! This is so gorgeous. Monticello is on my bucket list, so someday. Please visit me for a chance to win Annie Sloan's book!